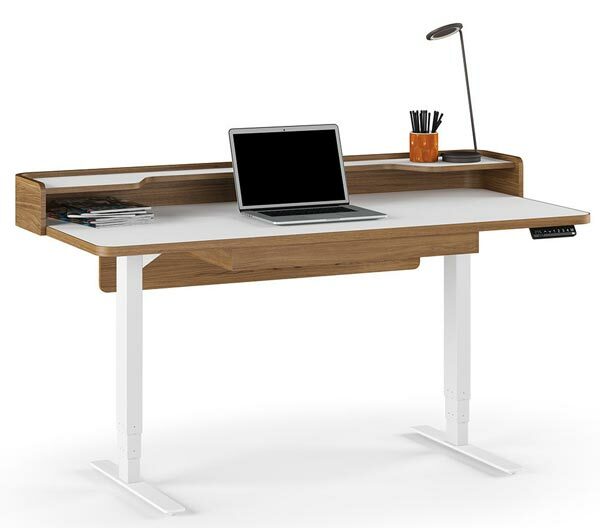 The Kronos 6752 Lift Desk from BDI allows you to sit or stand, just as you’d expect from an adjustable-height desk. Kronos is a little different from other standing desks I’ve seen, though, because it adds a shelf to keep your desktop organized. And its motorized adjustment makes going from standing to sitting and back again as easy as pressing a single button. The desk is made of powder-coated steel, high-pressure laminate, and walnut veneers. Work surfaces are smooth and durable. In addition to the shelf, there’s a flip-down keyboard and storage drawer that’s lined to keep contents secure. The workspace measures 61.75″ wide x 30.75″ deep; height adjusts from 29″ to 54″ tall. Height adjustment is simple with the electronically-powered leg system that’s controlled with the digital keypad. The keypad is programmable with four user-defined presets. Built-in wire management channels and a “modesty panel” on the back conceal wiring to keep your workspace neat and uncluttered. Kronos is available in white and natural walnut only. BDI also offers a matching mobile credenza and multi-function cabinet to complete your office. The BDI website can help you find a local retailer, or you can purchase BDI products from online retailers. One online retailer offering the BDI Kronos 6752 Lift Desk is the Modern Essentials website, where it’s available for $1999.00.